News that Warren Buffett's Berkshire Hathaway bought shares in some of America's biggest airlines has ignited investor interest in the industry. Warren Buffett is arguably the best investor of our generation, and while Buffett openly admits to having made mistakes in the past, tracking the stocks he's buying can be a great way to discover compelling new ideas for your own portfolio. With that in mind, a review of Berkshire Hathaway's (NYSE:BRK-B) (NYSE:BRK-A) third-quarter 13-F filing shows that Berkshire bought shares in three of the country's biggest airlines: American Airlines Group (NASDAQ:AAL), Delta Air Lines (NYSE:DAL), and United Continental Holdings (NASDAQ:UAL). CNBC reports that Berkshire Hathaway also bought shares in discount carrier Southwest Airlines (NYSE:LUV) last quarter. So far, cozying up to airlines last quarter is paying off. 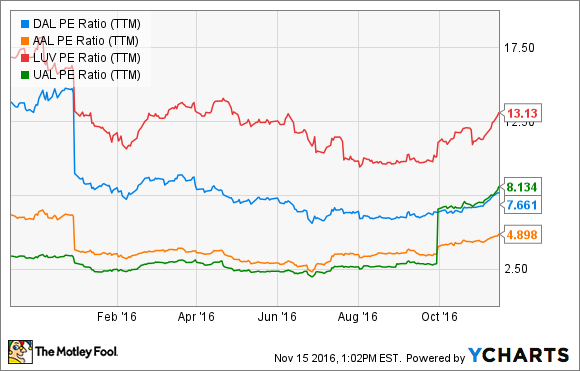 On average, these four stocks have rallied an impressive 21.6% since Sept. 30. Can airline stocks continue to climb? Read on to find out why these stocks have been added to Berkshire Hathaway's $132 billion portfolio, and to see if they might be worth adding to yours, too. Image source: Flickr user thetaxhaven. A terrible investment no more? At Berkshire Hathaway's annual meeting in 2013, Buffett was asked his opinion on airline stocks, and his answer wasn't encouraging to airline investors. At the time, Buffett said that "Investors have poured their money into airlines and airline manufacturers for 100 years with terrible results." He added that "It's been a death trap for investors." Buffett's comments at the time on the notoriously cyclical industry were reminiscent of his comments about airlines as investments roughly a decade ago. In his 2007 letter to Berkshire Hathaway shareholders, Buffett wrote "Indeed, if a farsighted capitalist had been present at Kitty Hawk, he would have done his successors a huge favor by shooting Orville down." Apparently, Buffett's softened his stance on the industry this year. Berkshire Hathaway portfolio manager Todd Combs convinced Buffett to acquire aerospace-supply giant Precision Castparts for $32 billion earlier this year, and now, it seems that either Combs or co-manager Ted Weschler has convinced Buffett that the airline operators are attractive too. Last quarter, one of them was responsible for buying 21.7 million shares in American Airlines worth $945 million. Also added to Berkshire's portfolio were 6.3 million Delta shares worth $301 million, and 4.53 million United Continental shares worth $285 million. Berkshire's shares in Southwest were bought after the quarter ended, so we'll have to wait to find out how many shares were acquired. Regardless, there have been big changes to the airline industry that may have made these companies more interesting to investors than they've been historically. 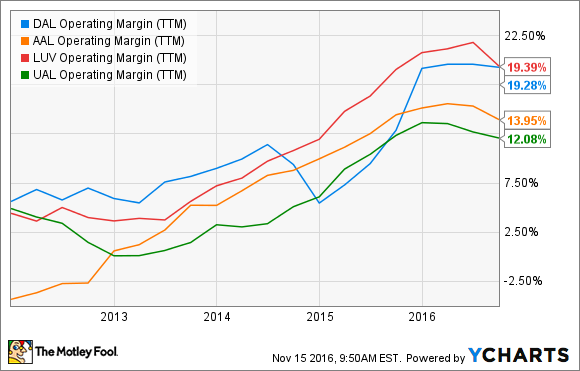 DAL Operating Margin (TTM) data by YCharts. The industry's improving profitability is even more enticing given that airline stocks continue to trade at some of the lowest P/E ratios in the stock market. The trailing P/E ratio of all four of these stocks is in the low double or high single digits. Considering that the trailing P/E ratio on the S&P 500 is about 25, an argument can be made that airlines aren't outlandishly expensive. DAL PE Ratio (TTM) data by YCharts. In the third quarter, airlines reported flat to lower revenue, but streamlined business operations still allowed them to make money. At American Airlines, $10.6 billion in revenue translated into net profit of $737 million. Delta Air's $10.5 billion in revenue translated into adjusted net income of $1.26 billion. And United Continental's $9.9 billion in revenue translated into adjusted net income of $997 million. Southwest's sales of $5.14 billion resulted in adjusted net income of $582 million. In the future, airline stock performance will depend on passenger counts and fuel prices; the latter represent about 20% to 30% of the industry's costs, depending on the year. Fortunately, both of those inputs could have tailwinds. The number of airline passengers worldwide will almost double to 7.2 billion people by 2035, up a compounded 3.7% annually, according to the International Air Transport Association (IATA). Growth will be best in developing markets, but North America is still expected to increase by 2.8% per year over the period. Jet fuel prices could continue to have a positive impact on profitability, too. Currently, jet fuel is about 5.5% cheaper than it was a year ago, and that has the IATA estimating that lower jet fuel prices will save the industry $21 billion this year. Longer-term, President-elect Donald Trump's campaign promise to open up access to federal lands for oil exploration could help keep jet fuel prices in check. Overall, it's anyone's guess whether or not airlines have truly overcome their past struggles, making this industry worth investing in for the long term. Berkshire Hathaway is willing to bet a little of its money that better times are ahead, but investors may want to keep Berkshire's bet in perspective. Assuming the company's Southwest stake is similar to those in Delta and United Continental, airlines represent only about 1.8% of Berkshire's equity portfolio.